Located in the beautiful complex of Los Geranios, 5 minutes walk from the beach and Puerto Colon. A 2 bedroom, 2 bathroom apartment. 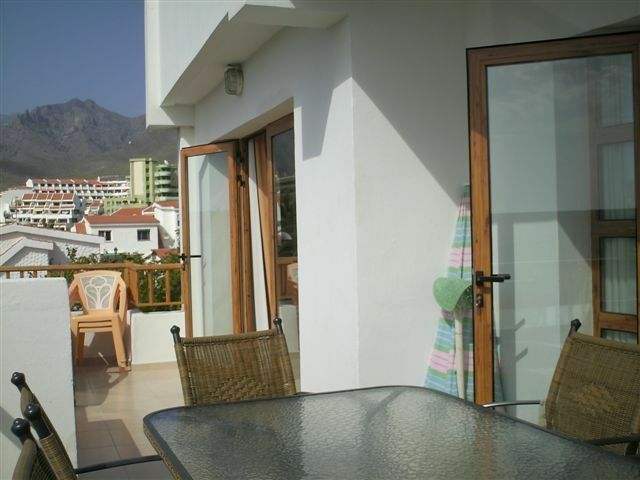 Fully fitted kitchen, lounge area with TV, DVD, CD player, safe, 2 spacious bedrooms, 2 bathrooms (1 en-suite), large fitted wardrobes, private terrace offering views of Teide and also partial sea views. The complex has a beautiful communal swimming pool, 24 hour reception, payphone and a launderette. Only a few minutes walk from the beach and Puerto Colon. Very close to San Eugenio shopping centre. Centrally located close to a wide variety of restaurants, bars and shops. This is just a small selection of the many activities available in Tenerife. Excellent but waiting for New kitchen to be fitted. The apartment is spacious with a very well equipped kitchen. The pool is great and fairly quiet when we visited. The apartment is close to the beaches and there are floats (and a foot pump) and beach umbrellas available for use. There are so many nearby bars/restaurants/supermarkets for easy dining out or in. The apartment building itself is quiet and the area seemed fairly quiet when we visited given that the town is busy. We visited with our 8-yr-old and would definitely book again if returning to Costa Adeje. This little gem is right where you need to be. Quiet enough not to be disturbed by late night music yet close enough to some fantastic bars and restaurants. The apartment is equipped with everything you need for a comfortable stay. We found the double balcony especially pleasing, having spent a couple of nights in. Another pleasing thing for my son was the Smart TV, keeping him up to date and entertained. It is situated next to Temple Bar pub and Scotch corner which do great home cooked food which we found delightful. Only a five minute walk (literally) to the beach and harbour. The complex has a generous sized swimming pool and bar. We’re already looking to get booked for a couple of stays next year. Pros: washing machine, iron, two spacious bedrooms, tv in every room, iron, cooker, kettle microwave, fridge, two bathrooms superb location, two lots of double doors on to the balcony, great being able to leave it open during the warm nights. Cons: couldn’t say there were any. However it seemed one of the previous guests had take the key to the safe. However we didn’t find this a problem as the apartment is extremely secure, triple lock front door with added security on reception (admittance via a buzzer or your key) so not just anyone could walk in to the apartment block. No hesitation in recommending this for a great stay for family’s and couples alike. This is an excellent apartment and is equipped with everything you can think of. It’s located in the San Eugenio which I think is the old Torviscas area. You will have everything at hand, Las America’s 5 minutes walk in one direction and Adeje 5 minutes walk in the other. Down the hill brings you to the beautiful Fañabe beach and there are some outstanding restaurants nearby. The apartment has 2 bedrooms both light and airy and great storage. The 2 bathrooms are such a treat so the kids could have their own. The showers are powerful and the washing machine great. The kitchen has everything you will ever need even down to Tupperware. The large balcony over looks Harley’s bar and even though centrally located you are not disturbed in the evening by any noise. We slept the whole 2 weeks with the balcony doors open although each bedroom has a fan to keep you cool. The pool is lovely and there are ample sun loungers although the complex could benefit from hiring out parasols as the shaded areas are limited. The pool bar is excellent, great food and so cheap. Our host were brilliant throughout this process and communicated quickly and efficiently. We cannot wait to return next year and have already booked. Situated in San Eugenio Bajo, about 200m from the sea front and Puerto Colon area. The complex is located very close to the San Eugenio commercial centre where there is a large supermarket. A wide variety of shops, bars, entertainment bars and restaurants are all within walking distance. Very close to the Aqua Park and the newly opened Siam Park. Public buses stop frequently at San Eugenio with routes going to many places all over the island.